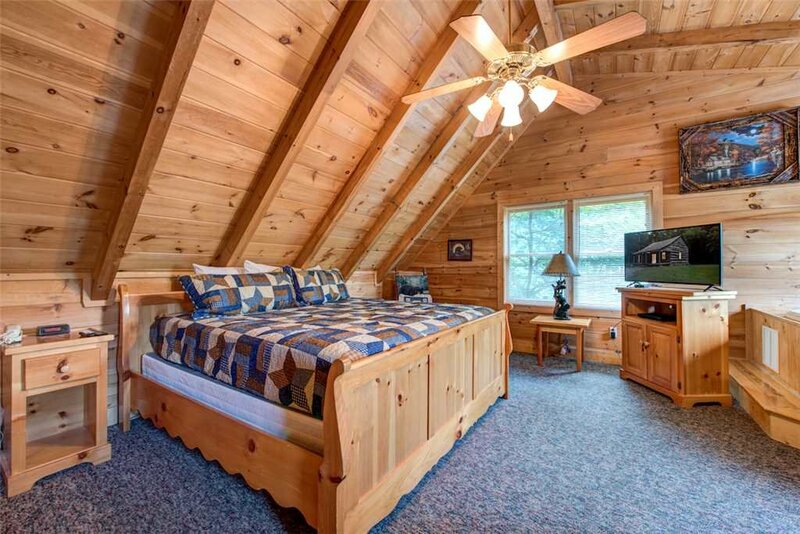 The master suite makes up the loft. 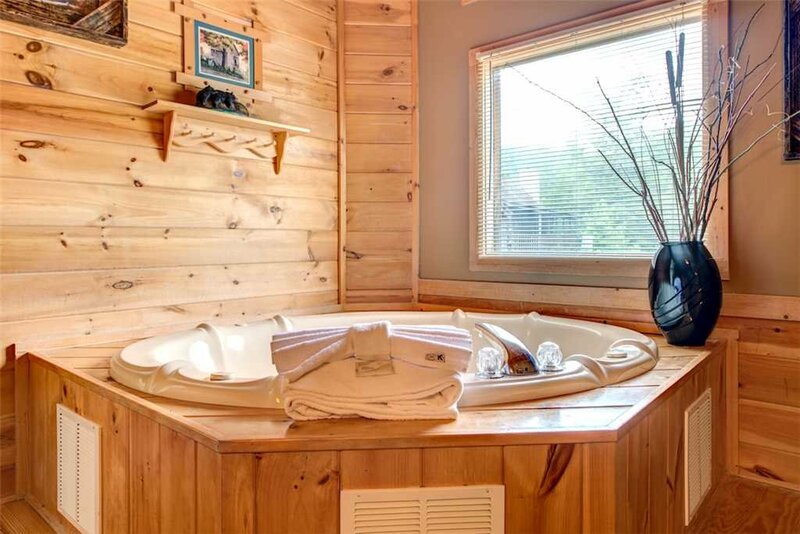 This luxury space includes a king-size bed, a private bathroom, and a jetted tub you’ll love lazing in after a day on the go. 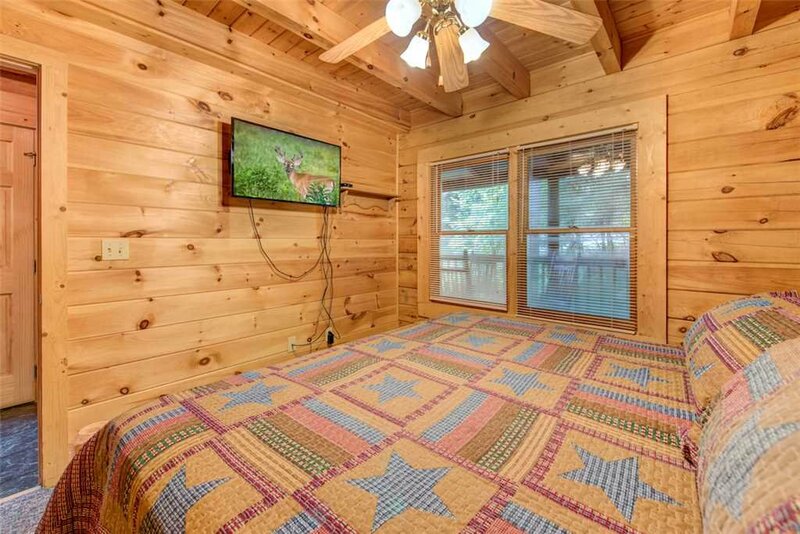 Like all the other bedrooms, it has its own flat-screen TV with cable. 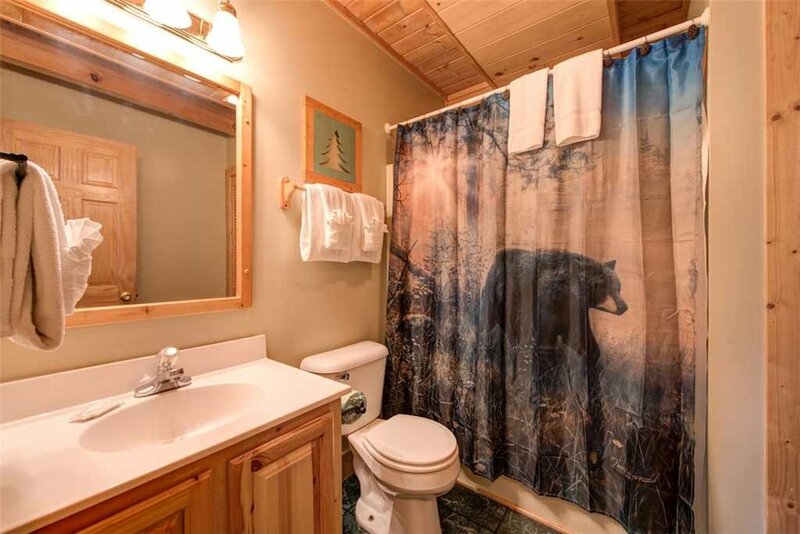 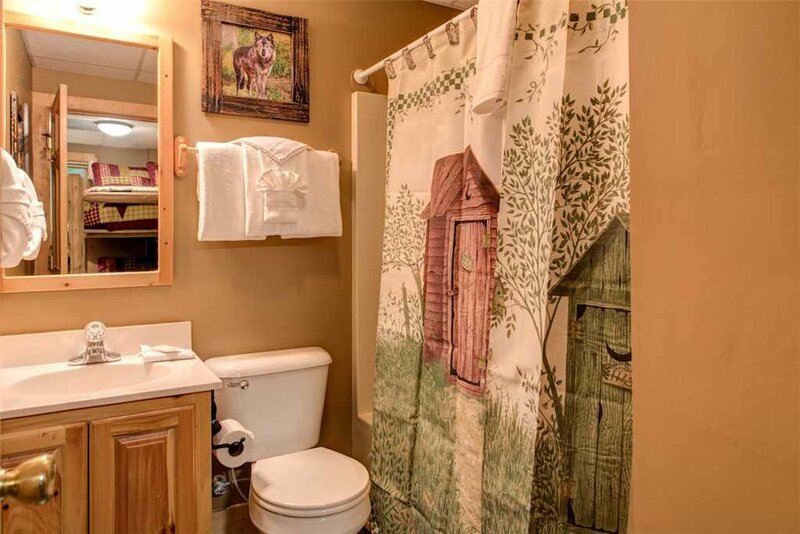 Because it’s the only room on this floor, it provides unrivalled privacy. 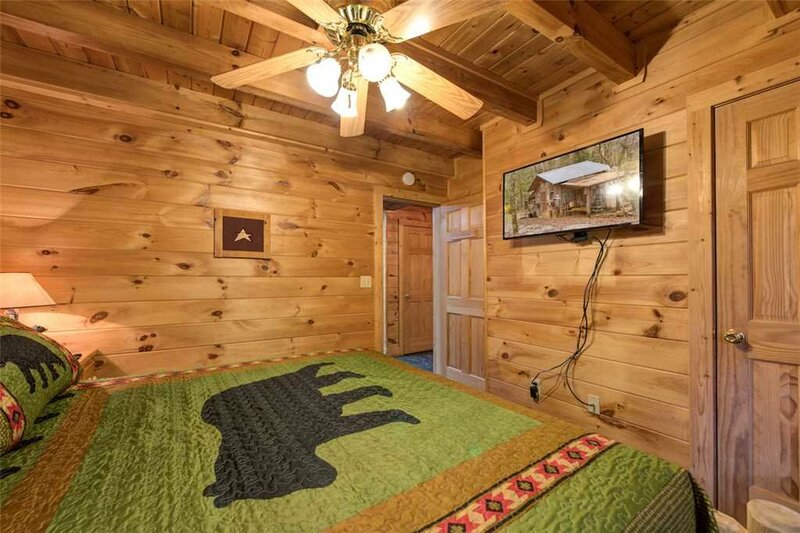 The main floor, right below, houses two bedrooms, each with its own luxe king-size bed and a TV. 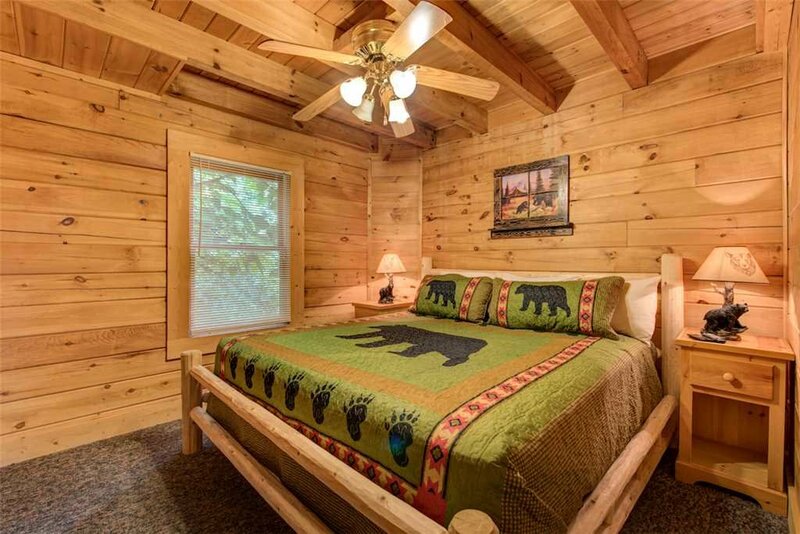 The beamed ceilings, wood-planked walls, and log-style furnishings give these rooms a restful, rustic vibe. 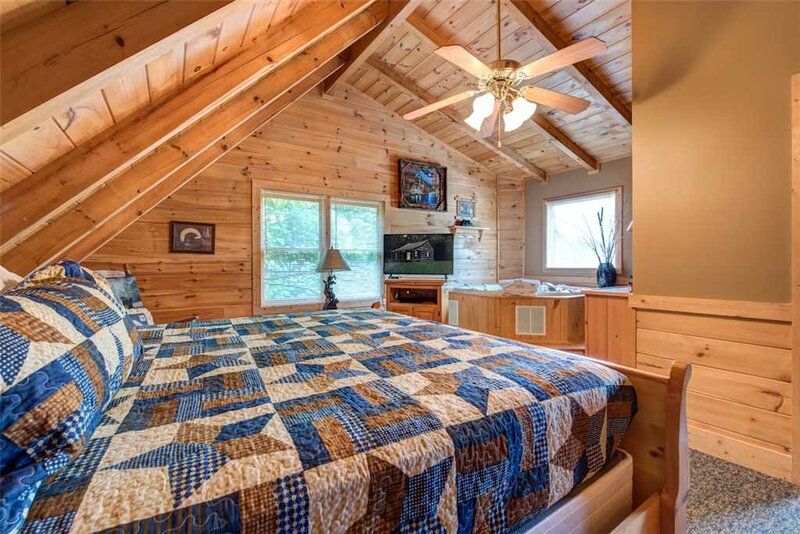 These bedrooms share a bathroom and are just off the great room. 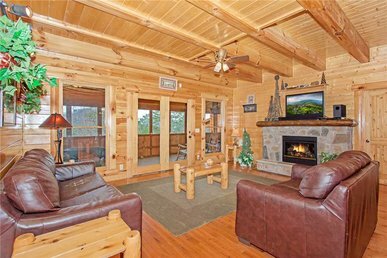 Open and airy, with a cathedral ceiling and a stacked-stone fireplace, the great room is everything you want a cabin’s main space to be. 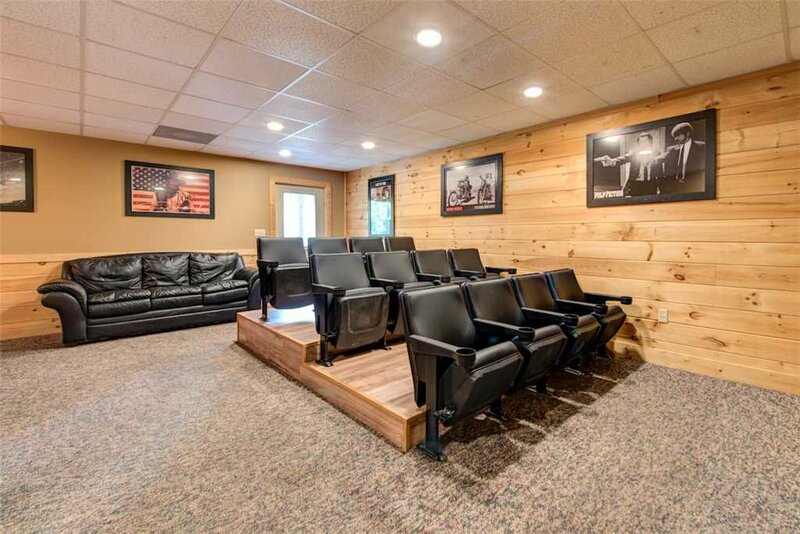 The leather sofas and armchairs invite you to kick back and watch a movie on the flat-panel TV, surf the web via the free WiFi, or play games with the kids. 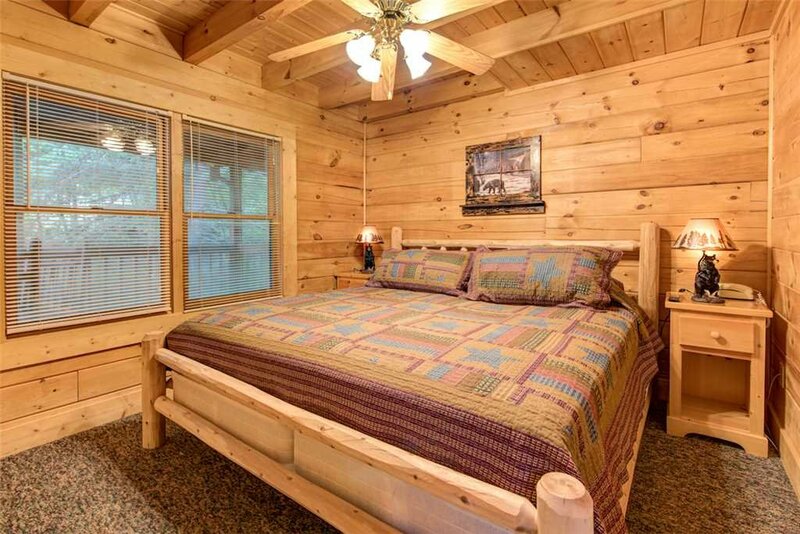 One of the couches opens into a queen-size bed, to accommodate two more guests. 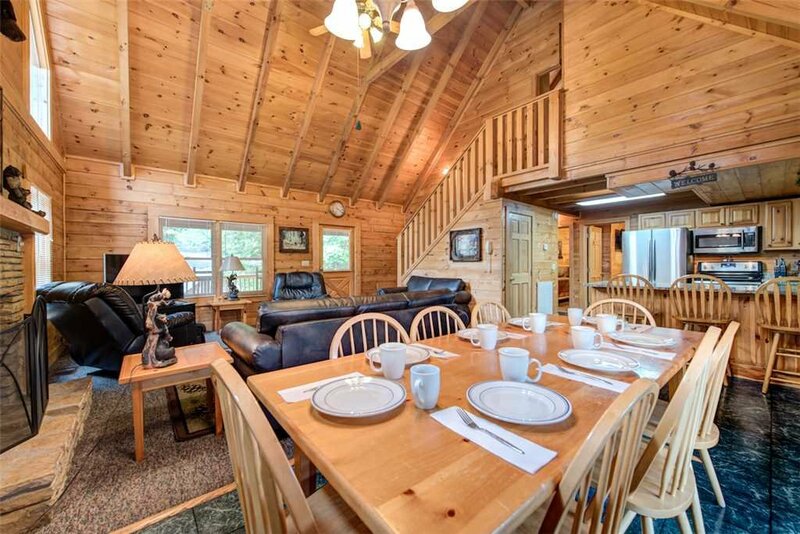 The dining area is also part of the great room. 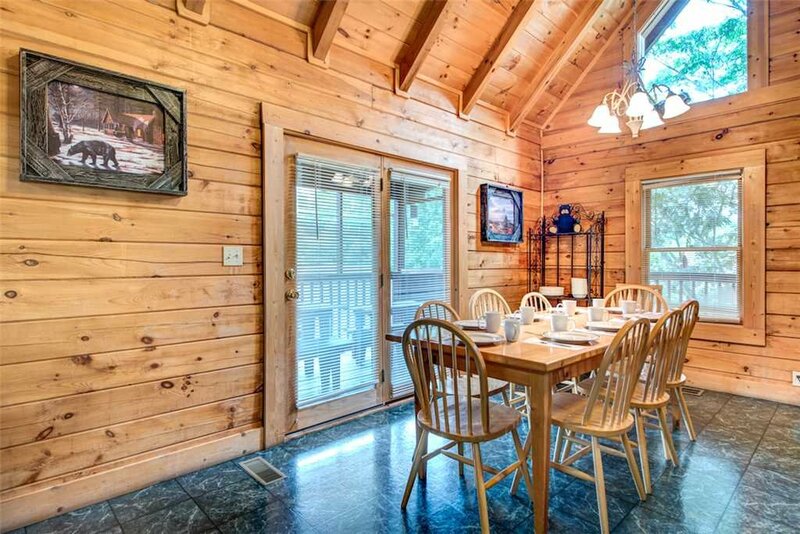 The table seats eight, and there’s room for three more at the adjacent breakfast bar. 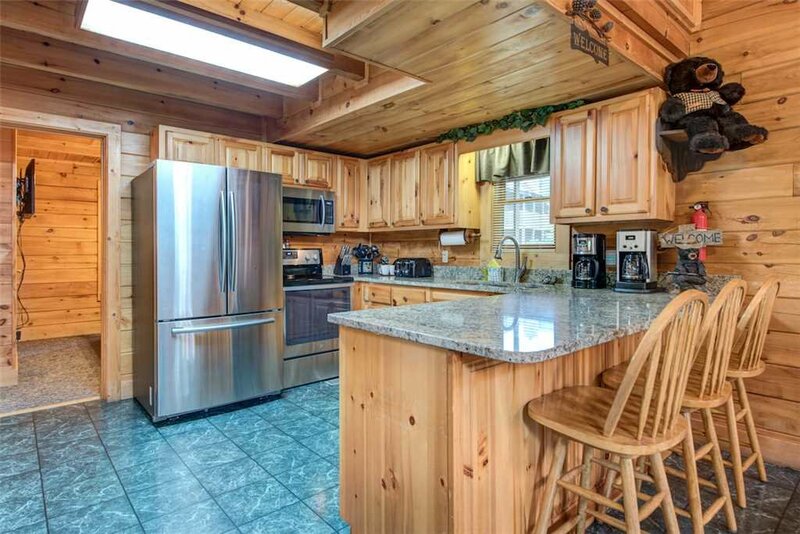 The breakfast bar is also a handy spot for sous chefs to sit and help with meal prep. 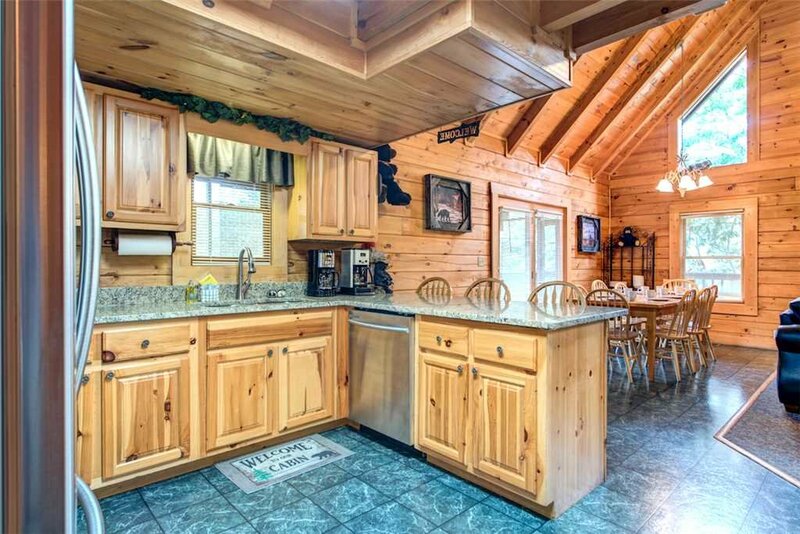 As for the kitchen, it’s fully equipped with stainless-steel appliances, cookware, and tableware so that you can feed a hungry crowd. 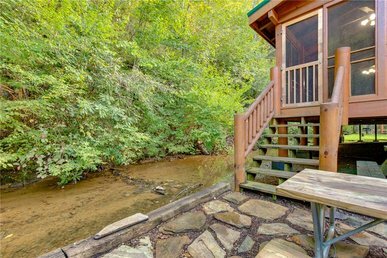 And you don’t have to eat indoors: The main deck is furnished with large picnic tables for alfresco dining, along with a gas grill. 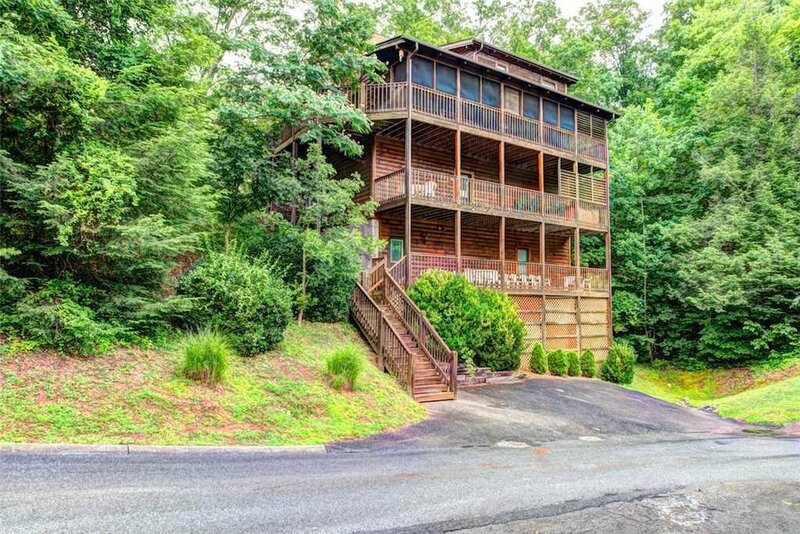 Down one flight, on the second floor, are four bedrooms and three bathrooms. 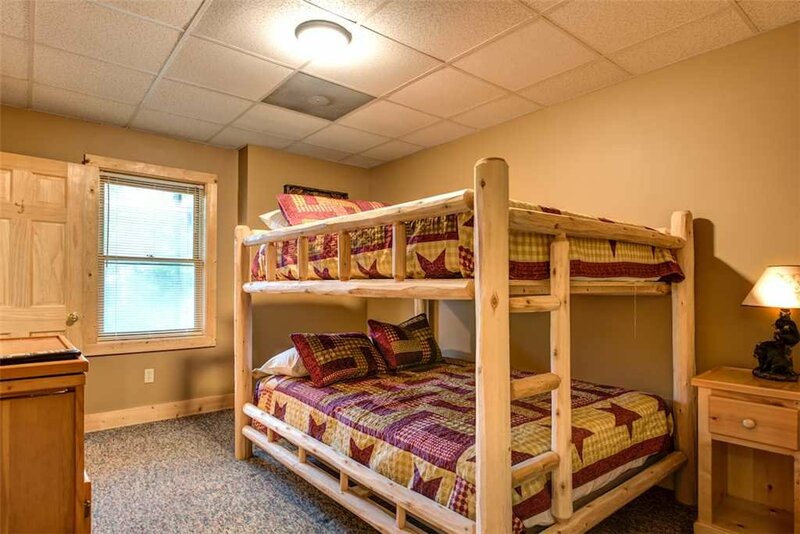 Each bedroom includes queen-size bunk beds that can sleep up to four people. 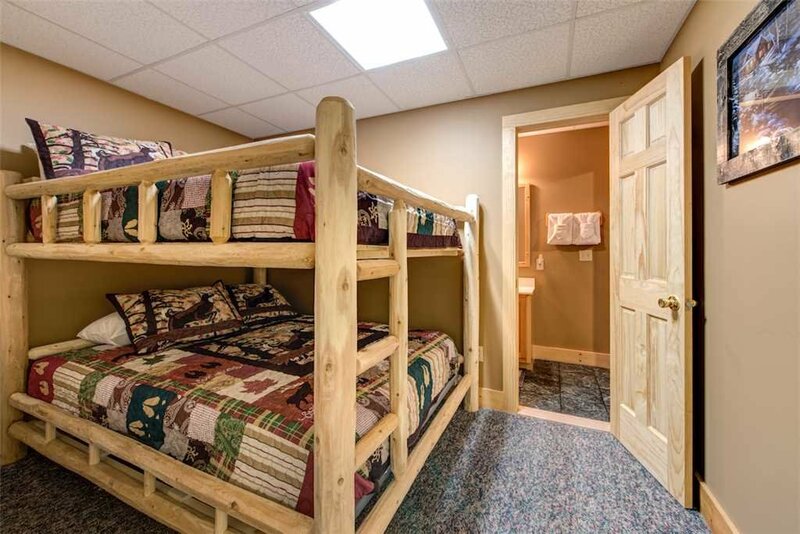 The kids will love bunking together—every night will feel like a slumber party. 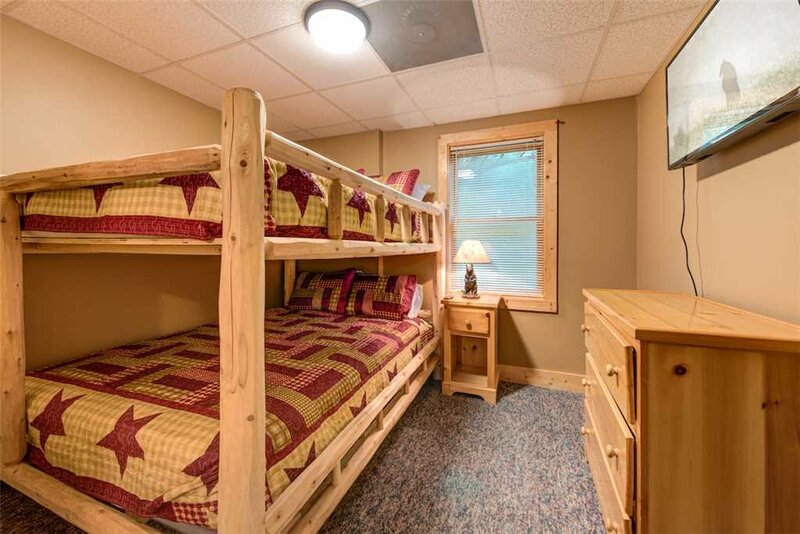 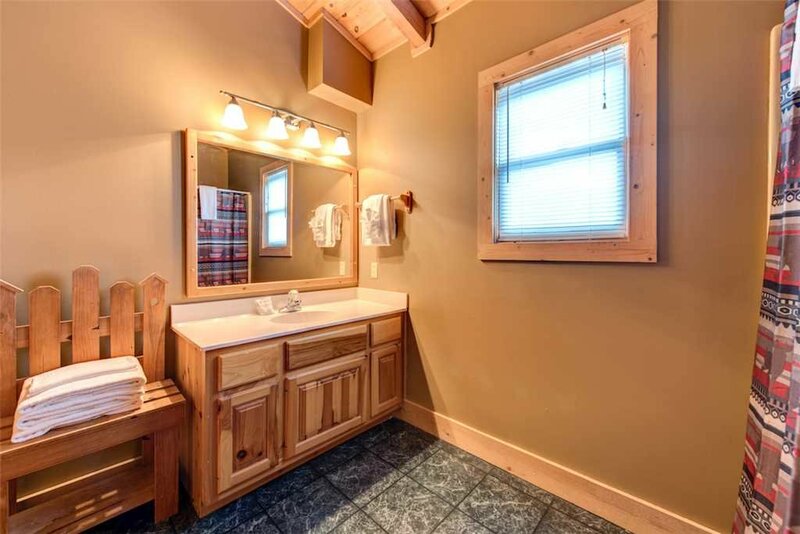 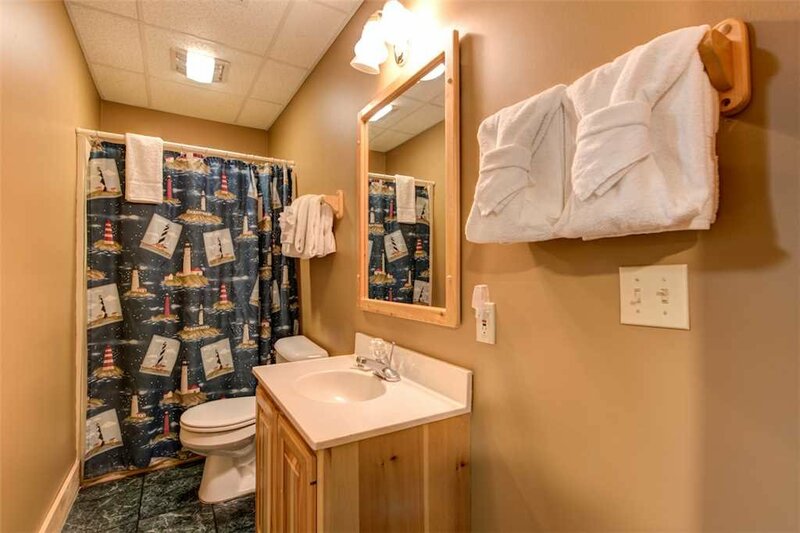 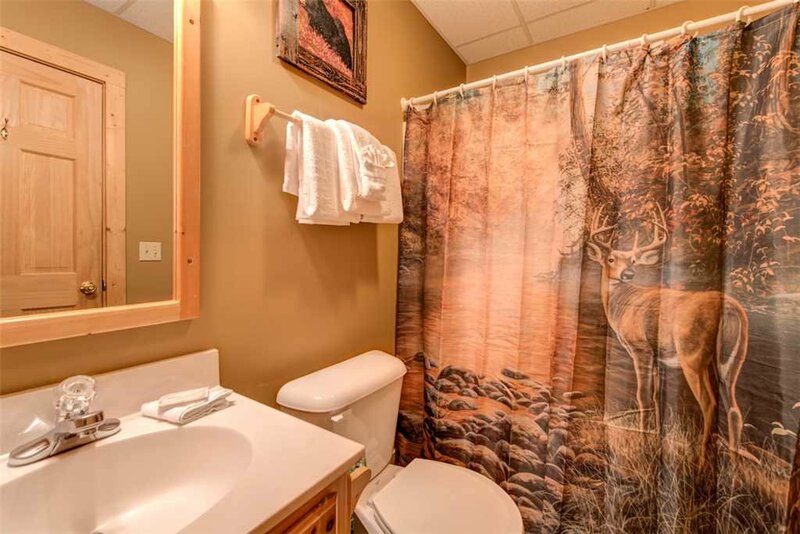 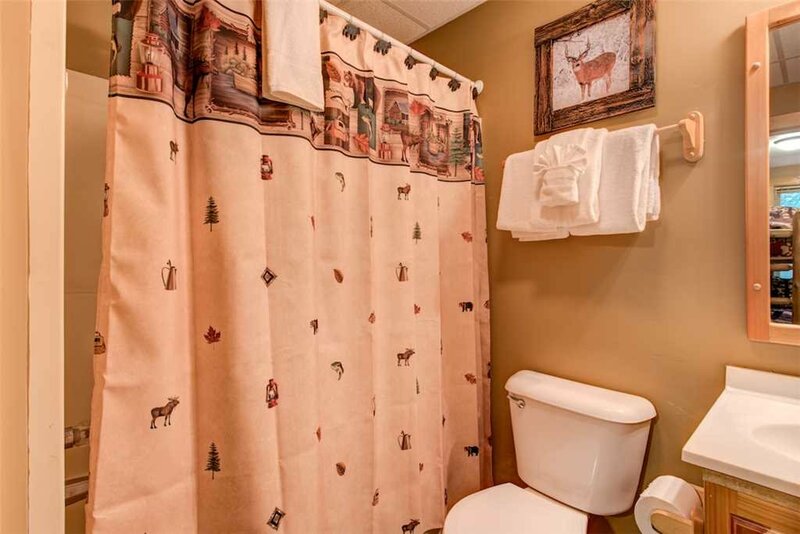 Two of these bedrooms have a private bathroom, while the third and fourth bedrooms share a bathroom. 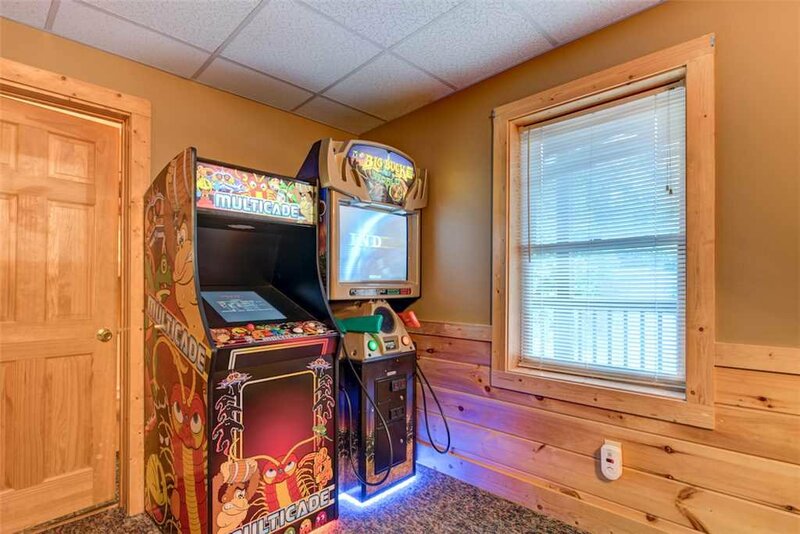 This floor also has a two-player arcade table. 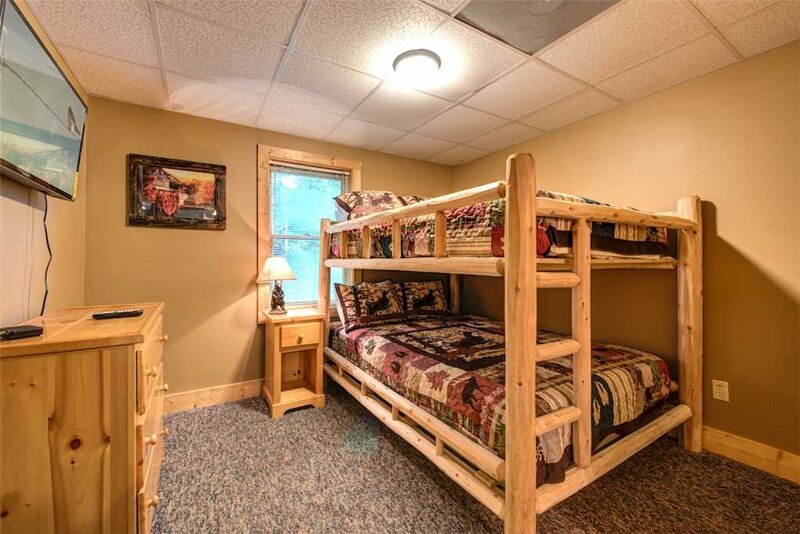 Downstairs is where you’ll find the eighth bedroom, which features another king-size bed, and the sixth bathroom. 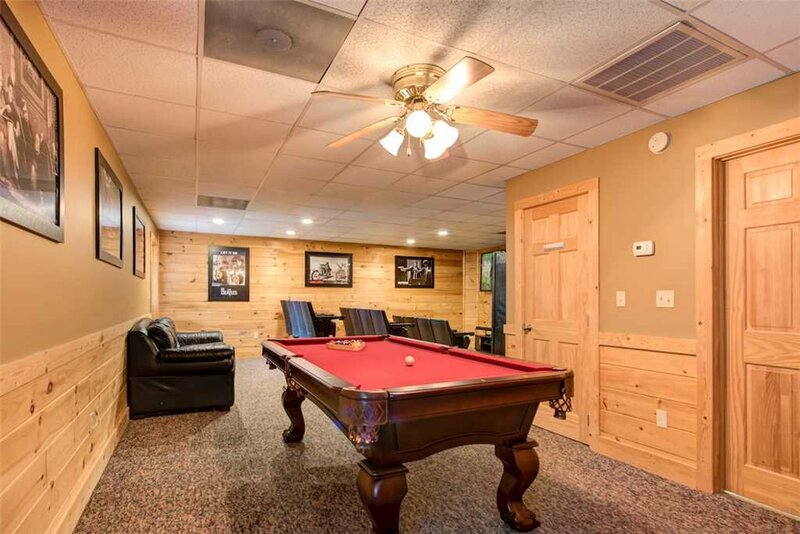 This floor also hosts Southern Dream’s home theater and game room. 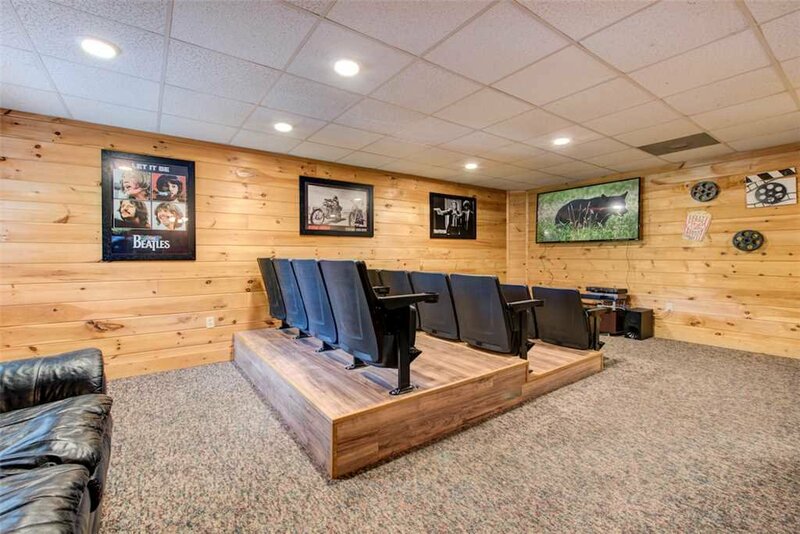 Once you view a movie here, in your private screening room with so-comfortable seats, you may never want to visit a cineplex again! 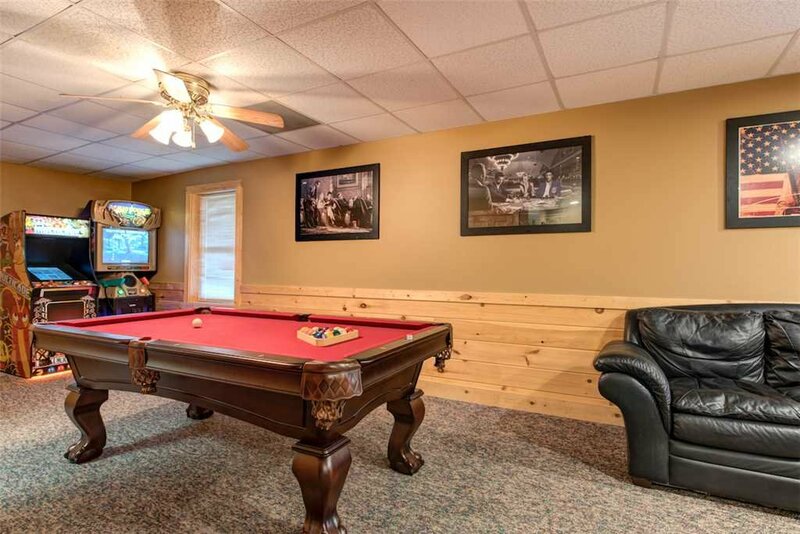 If you prefer playing to watching, you can shoot pool at the full-size table or try your hand at the game arcades. 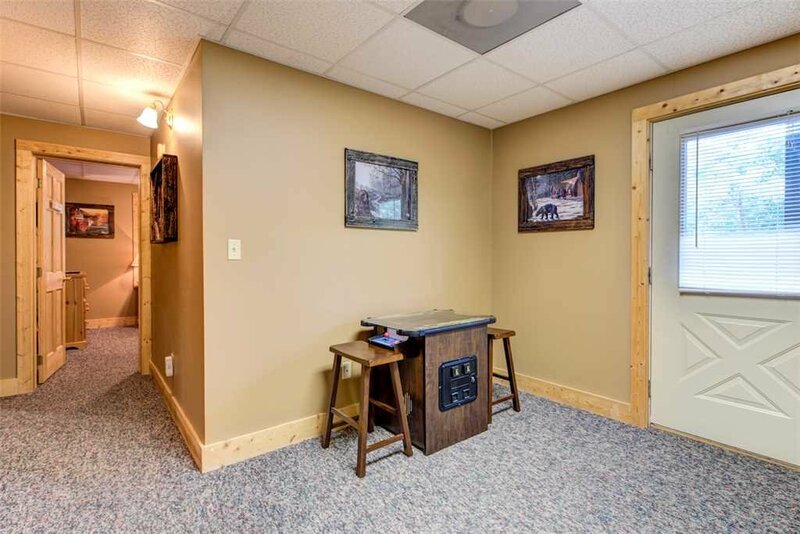 Should you work up a thirst, grab a drink at the wet bar—no need to head upstairs to the kitchen. 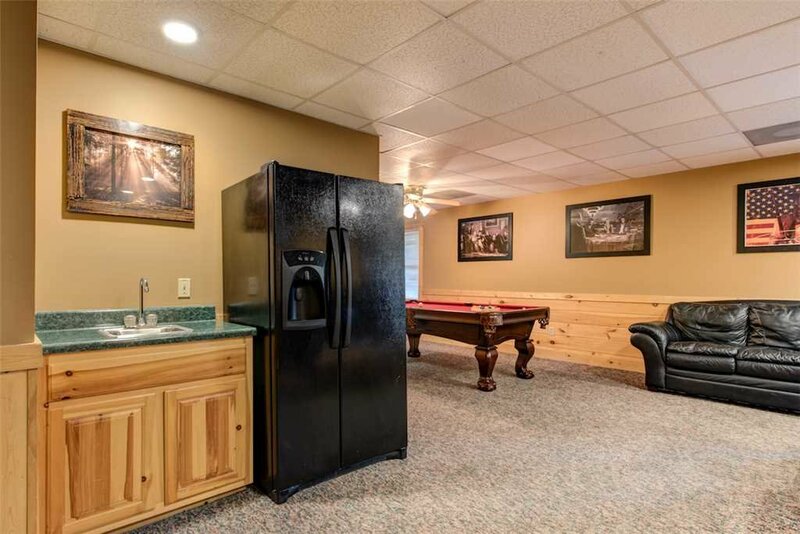 The wet bar includes a full-size refrigerator, where you can also store extra groceries. 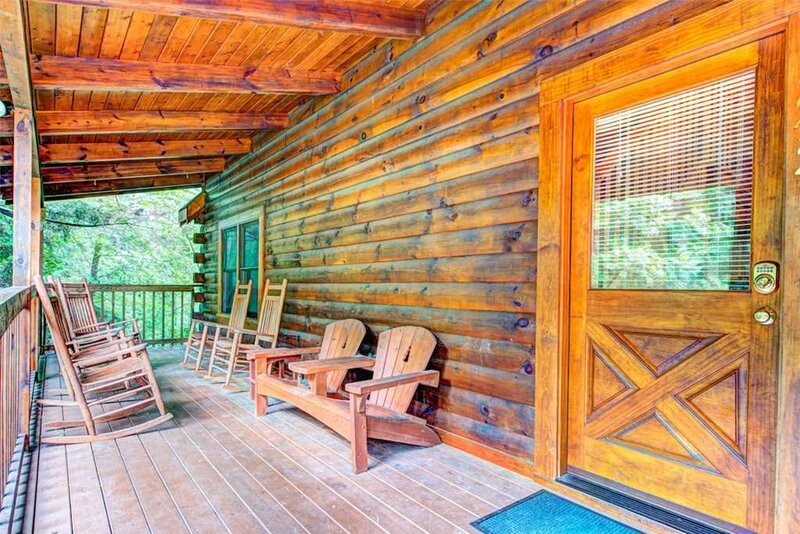 And we haven’t even talked about Southern Dream’s outdoor spaces! 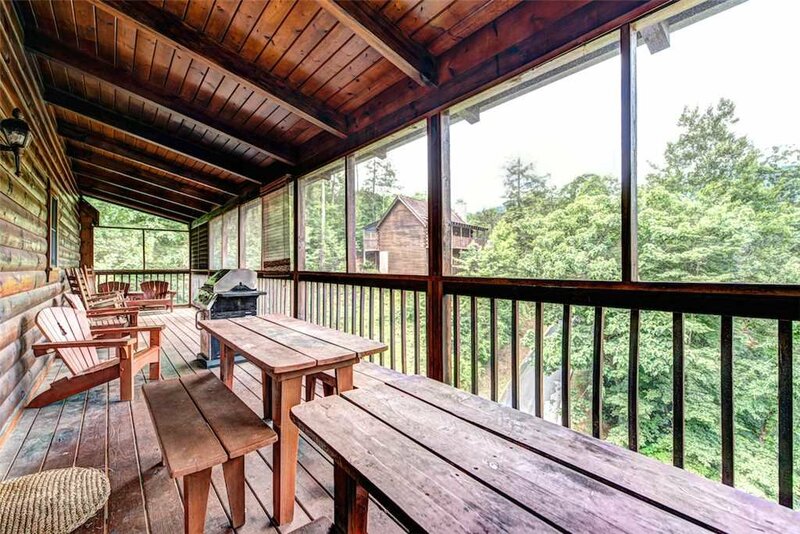 Each of the three covered rear decks spans the width of the lodge, as does the covered front porch, so there’s plenty of room for everyone to revel in the fresh mountain breeze, the singing of chickadees in the morning, and the star-studded sky at night. 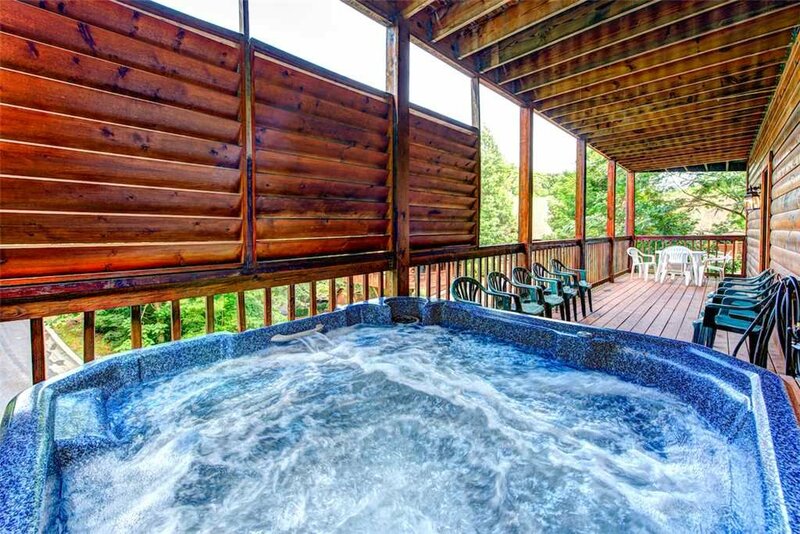 Each deck has numerous chairs and tables, and the middle deck includes a bonus: a roomy hot tub. 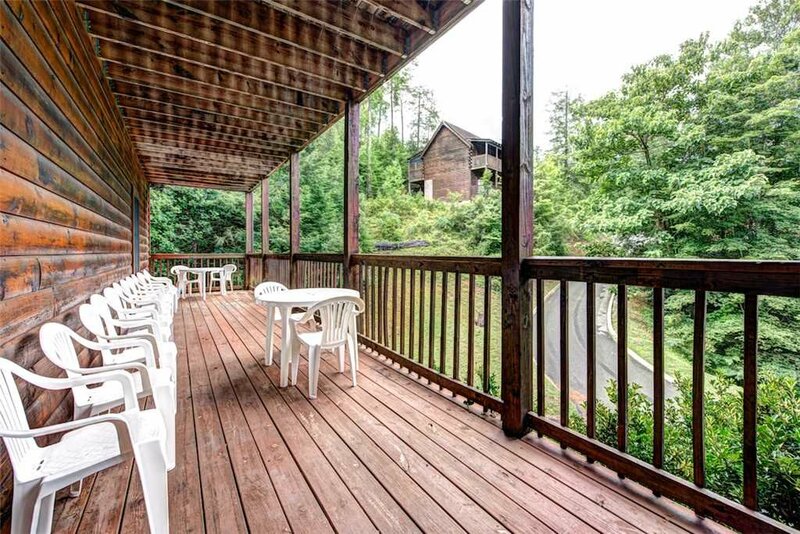 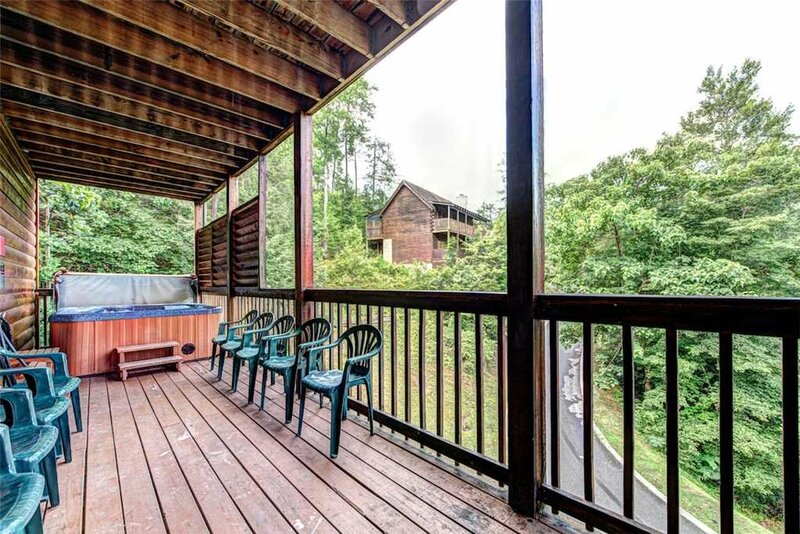 The front porch has plenty of rockers so that you can relax in true Smoky Mountain fashion. 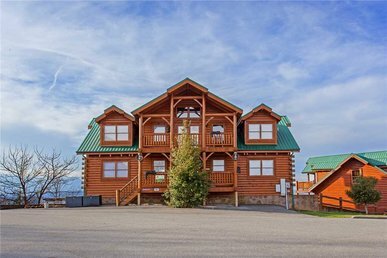 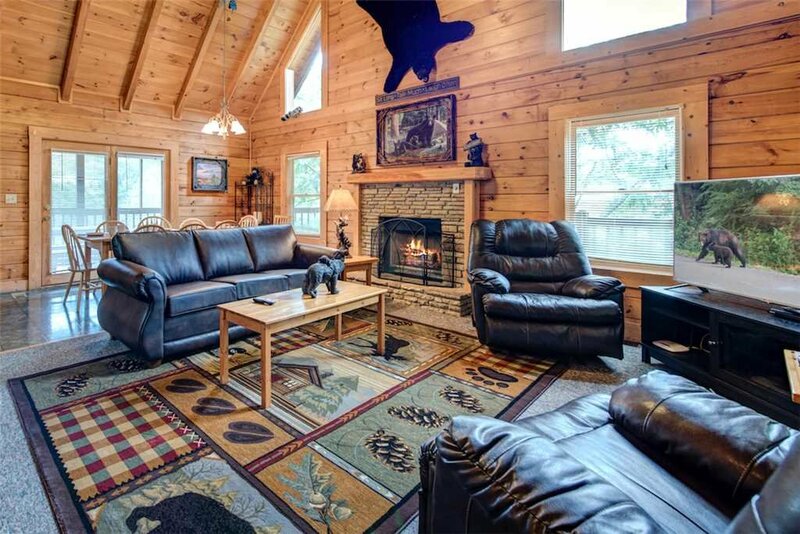 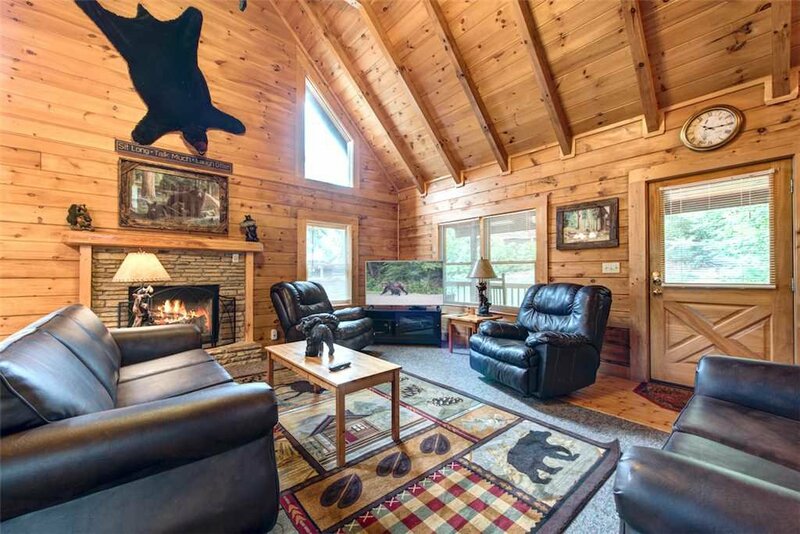 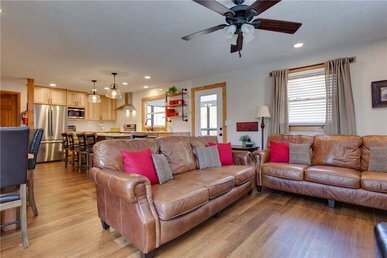 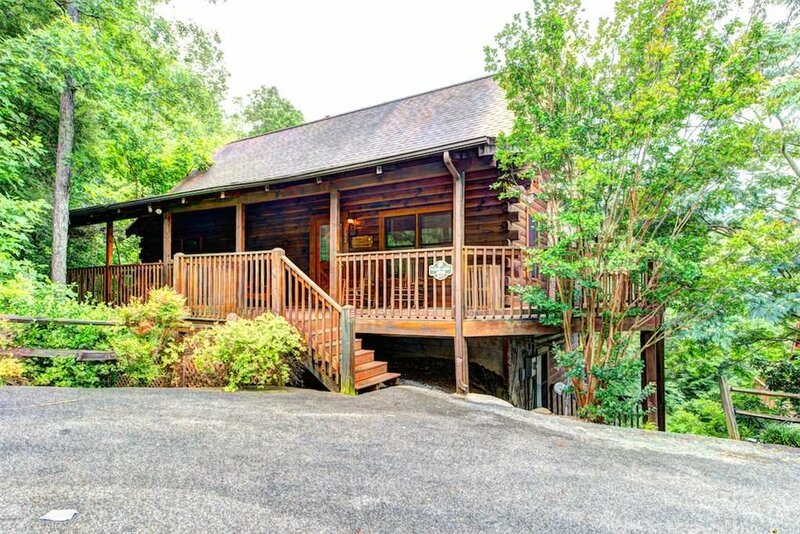 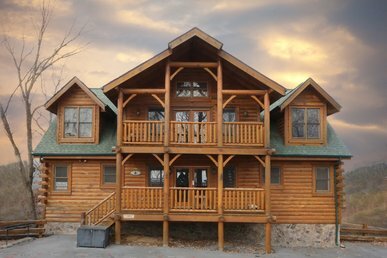 While you could easily while away your entire vacation at the cabin, you’ll want to take advantage of Southern Dream’s proximity to the area’s popular attractions. 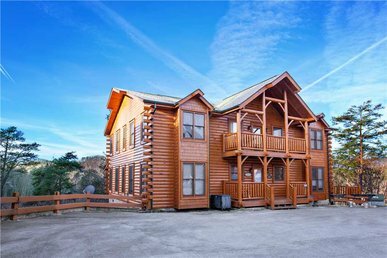 In less than ten minutes you can drive to Pigeon Forge Parkway, home to the Titanic Museum, WonderWorks, dinner theaters, restaurants, shops, and more. 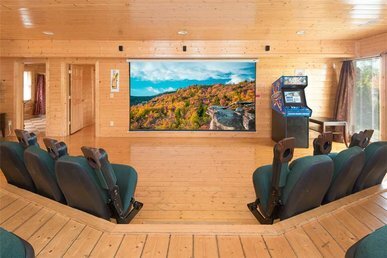 Drive a few minutes more, and you’ll be at Dollywood. 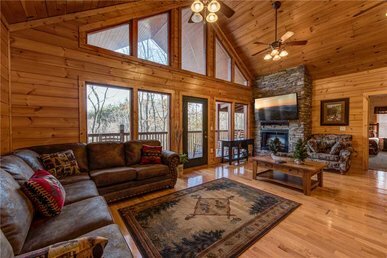 If you’ve been looking for lodgings to accommodate a crowd, your search is over: Southern Dream has everything you need, and more. 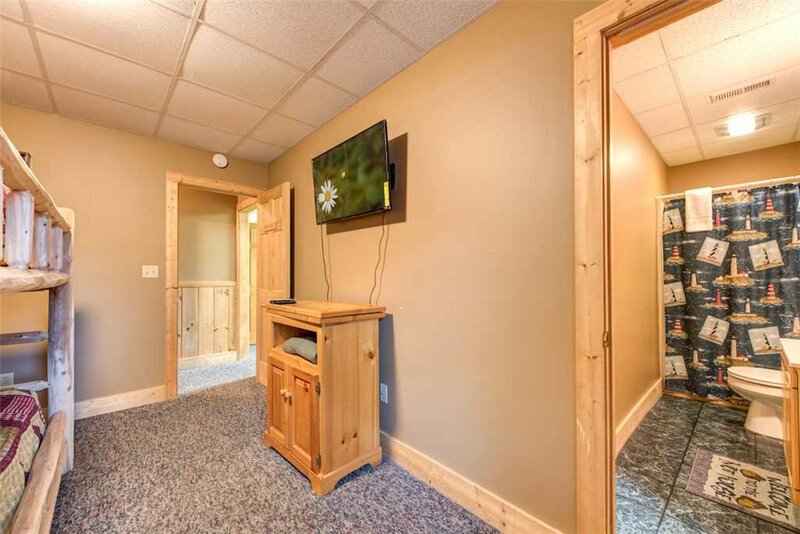 So book your stay today; your whole group will thank you!